Anybody seen the 499th most acclaimed album of all time pass this way? I saw him playing chess with Death yesterday. His crusade was a search for God. A 1969 baroque-pop cult favorite is this week's Counterbalance. Mendelsohn: Sometimes when I’m bored, I’ll just scroll through the Great List, looking for names I don’t recognize. 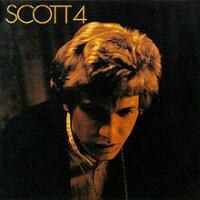 That’s why this week we will be talking about Scott Walker’s Scott 4. Sitting at numbr 499 on the Great List, Scott 4 is not exactly canonical but it was high enough on the list to make me wonder about the record. Top 500? Might as well check it out. Turns out I stumbled into one of the weirder music careers on record. Scott Walker (real name Noel Scott Engel) got his start in the '60s with the band the Walker Brothers (composed of a couple of guys whose real last names weren’t Walker either). The Walker Brothers were huge in England, where their middle of the road sound went down like warm milk -- a sort of antithesis to the Beatles’ effervescent reimagining of rock music. Scott then went solo, found even more success recording standards, before fizzling out toward the end of the decade. Interestingly, Scott 4 -- released in 1969 -- was a commercial flop. The album is comprised of material written entirely by Walker but was released under his real name. All subsequent re-releases have been rebranded with the Walker moniker. After a short and mildly successful reunion with the Walker Brothers in the '70s, Scott departed on a solo path that would see him become one of the world’s foremost avant-garde composers. These days he makes some weird, weird music, often accompanied by weird, weird videos. His signature baritone is still there, though, which is nice. My first couple of runs through Scott 4 had me scratching my head. Was this album really worth listening to? Is anyone going to still be listening to it in 20 years? Why is anyone listening to it now? Why am I listening to it now? After a while I sort of just stopped thinking about and found myself enjoying Walker’s signature baritone, schmaltzy backing vocals, sweeping orchestration and all. I’m on board. And I will be subjecting everyone I know to Scott Walker’s beautiful MOR stylings. What do you think, Klinger:? Is Scott 4 still worth listening to? Klinger:: That's a tough one to call, since no one especially listened to this record when it first came out, and only marginally more people have gotten around to listening to it since. I know that, as an inveterate Mojo reader for more than a decade, I've had Scott Walker on my radar for quite some time but it's taken your persuasion to getting around to listening to him. And it's been quite the shock to the system. My first several runs through the album had be thinking that this sounds like Andy Williams Sings the Leonard Cohen Songbook. I'm still finding my footing even now. You're really too young to remember the notion of easy listening music, but there was a time when there was always that one radio station that played (what our local station WLQR called) Music for the Good Life. And it was everything that people who liked rock 'n' roll were trained to hate. So the first blast of Herb Alperty trumpet blasts through on "The Seventh Seal", my ears immediately seize up on me. But here's the thing: everything tells me that this record has a lot to offer. People I trust stand by it. I can tell that the lyrics are at least as smart as other records from the late '60s that I admire. But the fact that so much of the music sounds like it could be performed on The Carol Burnett Show is confusing my senses. Help me figure this out, Mendelsohn. Walk me through it. Mendelsohn: I have no idea. Honestly, I was hoping you would have been able to provide a little more insight into this record and its placement on the Great List as you have a greater love for the music of the '60s than I do. But if the blind must lead the blind, please take my hand and watch out for that first step -- it’s a doozy. I like the cinematic sweep of Scott 4. There is a majestic, operatic quality to the record that is completely different from the wail of rock 'n' roll. It starts with the opening track of “The Seventh Seal” as Walker recounts, in rather astonishing detail, the events of Igmar Bergman’s 1957 film of the same name. For the most part, the rest of Side A is straight ahead balladry, the type that makes most rock purists cringe (and I still do from time to time) but Walker is such a deft artist that it’s hard not to get behind his vision, especially when he starts to sneak little bits of rock, funk and country into his songs. “On Your Own Again” is simply beautiful, just a gorgeous folk number that has been fleshed out with a string arrangement. Skip ahead a few tracks and you get “Boy Child”, which is an ethereal psychedelic freakout masquerading as a ballad. But if you aren’t willing to sit through the balladry of Side A, you don’t get to experience the weirdness of Side B. The second set of this record is possibly the best part as rock and funk pushes Walker into a deeper groove. Klinger:: OK, I'm seeing part of the issue right now. I haven't been thinking about this album in the two-sided LP sense of the word. And you're right, there's a marked difference in tone between what we would have called Side A and Side B. That's an interesting point, one that merits consideration as it (1) Reinforces Walker's commitment to LP artistry (since in 1969 the LP truly was the pinnacle of the serious musician's art) and (2) Forces us to reevaluate our understanding of the album in this current CD/MP3/RAR file era. However, I'd also have to say that the lugubrious slog that is "Angels of Ashes" leading into "Boy Child" practically defies a fellow to actually get up and flip the record over. Also, I might humbly suggest that you're overstating the case when you refer to anything on here as "funk". Mendelsohn: Much of my assertions are complete overstatements, but being slightly hyperbolic is the only way I can talk about this record without sounding downright dismissive. We will get to the funk. There is some funk, I promise. Side B starts with “Hero of the War”, a scathing rebuke of the Vietnam War, which is a blistering response to the violence in an oddly upbeat little ditty that sets the stage for the best track on the record. “The Old Man’s Back Again” was the song that convinced me this record belongs in the Great List. “The Old Man’s Back Again”, is driven by a funky bass line (there's the funk) but Walker still manages to work in a string arrangement, disturbing backing vocals, and deep lyrical content. As much as I want to, I can’t write this album off as some sort of goofy lark or simple MOR radio fodder. There is a deeper level to Walker’s music that gets washed over by the string arrangements and deliberate pacing. I was set to chalk up Scott 4 as a place holder for the much-maligned genre, but I think that would be unfair to such wide-ranging and well-thought out material. The man is an excellent songwriter, especially considering his overblown approach to pop music. As much as I want him to strip down some of these songs, it’s the extraneous material padding out the tracks that take them from good to incredibly interesting. Check out “Get Behind Me”. More balladry? It starts off that way, but then Walker kicks it up a notch with a soulful explosion of electric guitar and backup singers before the strings take back over. It’s the give and take on this record that I find most amazing. Walker treads a very fine line between the absurd and being overly earnest, but he does it so well that I can’t help but be drawn in. Klinger:: Yes, things do get cooking, to an extent, on what would have been Side B. Although I have to admit that after that one-two sauna at the end of Side A I was so addlepated that it took me several listens before I actually noticed "The Old Man's Back Again". (True story.) Once I did, I realized I had to keep digging even further. At any rate, do you think that it is Walker’s overall career path that has led Scott 4 to be as well-regarded as it is? After all, this is his highest-rated album. Not only was it a notorious flop, it was the kind of flop that made him reevaluate his career a couple times over, first in his efforts to re-ingratiate himself to his fan base and then again to reinvent himself as a full-fledged avant-garde artiste. It’s exactly the kind of story that critics can't help loving because it creates such a fascinating narrative, and Scott 4 serves as a fulcrum for the whole tale. Mendelsohn: If Walker hadn’t pushed forward with his music career and reinvented himself as a premier avant-garde composer, I don’t think we would be having this conversation. His newer material is far too obtuse to push toward the top of the Great List, but getting to hear an artist, and a great artist at that, make some of the best MOR music ever put on wax will always be a treat to the ears -- even as your eyes glaze over and you drift off into the string arrangements.